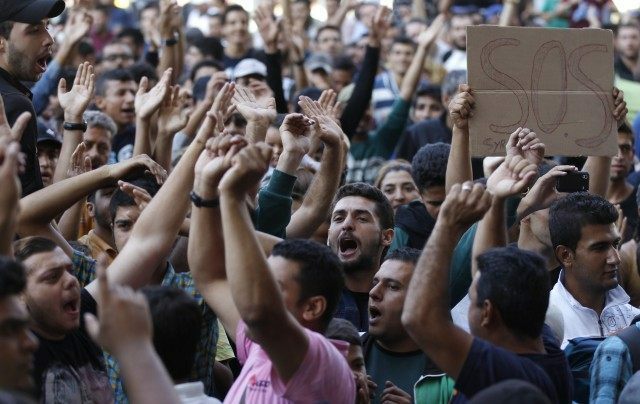 GERMANY: MUSLIM SETTLERS WANT THEIR CASH, SUE STATE FOR NOT COUGHING IT UP FAST ENOUGH……. – The Tundra Tabloids……. GERMANY: MUSLIM SETTLERS WANT THEIR CASH, SUE STATE FOR NOT COUGHING IT UP FAST ENOUGH……. Because doing this in a Germany only a 7 decades from the Jewish Holocaust, is such a great idea. Twenty migrants have sued the Berlin State Office for Health and Social Affairs because they had to wait more than a week to register their asylum cases and receive welfare handouts. They are demanding instant payment. Germany is struggling to cope with the 1.5 million migrants it expects to absorb this year and those arriving in Berlin often have to wait days if not weeks to be registered at asylum centres. The group of twenty who have decided to sue claim they have had to wait more than a week. Their “urgent application” has been confirmed by a court spokesman, Die Welt reports. The court spokesman said the plaintiffs were seeking to “put pressure on the authorities” by bringing the case, and the court would issue a ruling in the coming days. The spokesman said that the incident was just one of several similar legal cases brought by migrants over the past two weeks. “We can do it!” proclaimed German Chancellor Angela Merkel in reference to the migrant influx at the beginning of September. However, just this morning, it was announced that the nation would be extending temporary border controls until the end of October, AFP reports. Previous Post Previous Post FINLAND: TEACHING MUSLIM SETTLERS OF GENDER EQUALITY, FINNS ABIDE BY LAWS, AND THOSE REJECTED FOR ASYLUM GET MONEY TO LEAVE……. Next Post Next Post FINNISH STATE BROADCASTER (YLE) CAN’T MENTION “JEWS MURDERED” IN HEADLINES: “THREE DIE IN J’LEM”……. The sound of fans cheering on their heroes in the final round of a Russian Roulette Tournament. This level of political lunacy has not been seen in Europe since August, 1914 and the parades and celebrations that attended the start of World War I. An entire generation of young European men were slaughtered in trench warfare by 1918. Europe is forever changed on the decision of a single leader, and will never be the same. What it will become is anyone’s guess. Two things are certain; this is the worst time since the 1930’s to be a European Jew, and Israel will soon be facing Europe as an existential enemy.